Donate to the U.S. tour of Drum Casket: a social artwork. 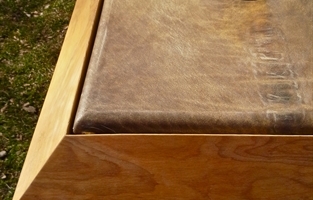 The marriage of casket and drum, Drum Casket is a wood and buffalo hide box. Participants take turns lying inside while a small group drums on the lid. Please donate to Drum Casket USA! Help us get this artwork on the road! 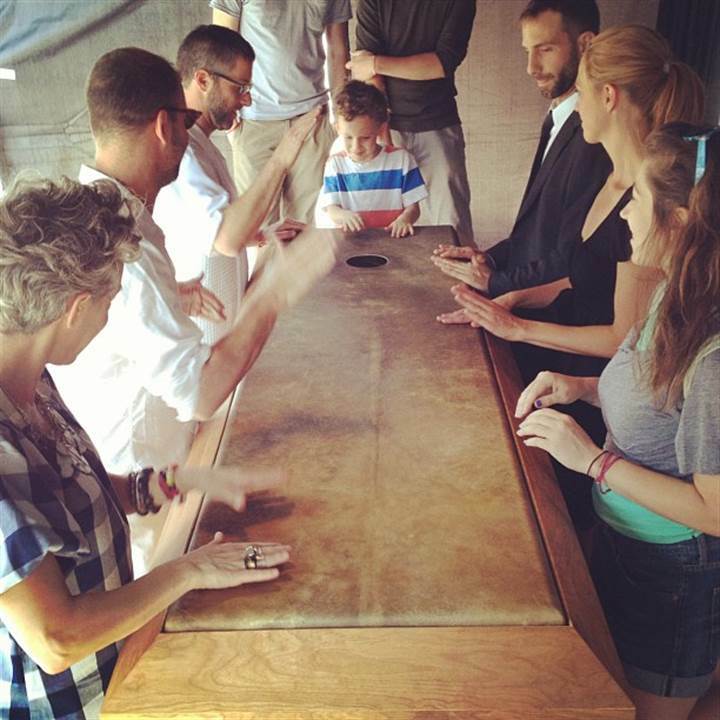 Drum Casket USA is an interactive sound installation and performance piece. The designed interaction is centered around artist Amery Kessler’s invented instrument, Drum Casket. 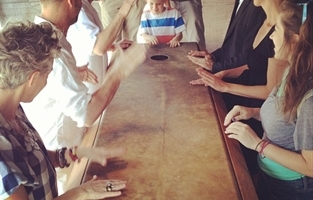 Hovering among topics of human interconnection, societal rituals, tangible and ephemeral experience, and visible and invisible barriers, the U.S. tour of Drum Casket will enable the collection of an audio archive of drumming, and will spin a thread of shared experience through participating audiences nationwide. This project begins with a tour of the United States, which will take Drum Casket to audiences nationwide. During this tour, audio files and documentation will be collected of all the drumming sessions. Upon returning to New York, Drum Casket USA will be presented as an immersive audio installation. The New York showings will include artist talks, workshops and interactive performances. How much does your donation help? If 100 people give $30, we will have gas covered for the entire 9,400 mile tour. If, in each of the 26 tour cities, 10 people give $20, 5 people give $40, 3 people give $100 and one person gives $300, the entire project will be funded. Drum Casket USA is happening by the will, determination and hard work of two people. It is scheduled to be hosted by 34 people in 26 cities across the country. Drum Casket is an artwork that falls outside the realm of the commercial, so Drum Casket USA needs your support to reach audiences. Any amount makes a difference. The tour portion of the project begins on August 1st 2013. Amery Kessler and Mary Jane Ward will begin driving Drum Casket to interactive audiences across the United States, collecting audio recordings of people drumming on the invented instrument. ​ Starting in New York, Drum Casket will visit 26 cities in 60 days. In each city, a local host will collaborate with the artists in order to invite the participatory audience and arrange for a venue. Visiting cities of all sizes, and groups of people from diverse backgrounds, each Drum Casket event will be different yet connected. 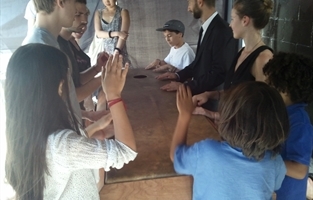 Drum Casket will reach hundreds of people otherwise unlikely to get this unusual interactive, connective experience. The collected sounds of the drumming, recorded for each person who lies inside Drum Casket, will be brought back to New York for the exhibition and interactive showings. New York audiences will hear the drum sounds of hundreds of people, and participate in their own Drum Casket sessions. Visit www.drumcasket.com to keep up with the latest and join the forum. Read articles by Amery Kessler and Mary Jane Ward as they share stories from the development of the piece, and stay tuned for event announcements and tour news. The website is also the future home of all documentation of Drum Casket's trip across the country, and of the collected audio recordings. 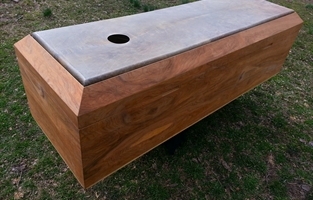 Drum Casket needs your help in order to reach audiences. Please donate now!